Or, as my friend refers to him, "creepy mustache guy." Creepy Mustache Man is in the British army. We don't know anything about his background or even what his conduct on the field was, but evidently he gets wounded and sent back to England. He is sent to Downton Abbey once the house has turned into a convalescent home. It's for officers only. There, he meets one of the maids, Ethel. As you can probably tell, they get quite friendly. They're found out and Ethel is summarily fired. Maids at the time were not allowed to have relationships. In particular, being an officer, Bryant must be some sort of upper middle class or aristocratic chap outside of the army. I hear that we're going to meet his father soon, so I suppose we'll find out then. Ethel, despite her big dreams, must come from a poor, country background, as many of the maids at Downton do. Ethel falls pregnant. After she gives birth, she tries--in vain--to contact Major Bryant, who has recovered enough to leave Downton. Bryant will have nothing to do with Ethel or the baby. By the social structures of the time, Ethel has broken the cardinal rule of giving in to her desires and is paying the price. She lies in order to work, telling her employers that her husband was in the army and was killed. In Ethel's place, Downton takes on a new maid. Jane is a war widow and must now take a job and earn her living in order to support herself and her son. Though there is a little resistance to hiring a mother at first, the butler, housekeeper and Lord Grantham decide that Jane should get the job. Not only is she qualified, not only does she have a son, but her husband died serving his country and there is a pervasive sentiment that as her husband died serving his country, we owe him our thanks and will help his widow. The only difference between Ethel and Jane is that Jane was married. Downton becomes full of recuperating soldiers, all officers. When war breaks out, Lord Grantham, who served in the Boer War, expects to be taken back into the army and perhaps even sent to France. Instead, he is given the title of Lord Lieutenant of Yorkshire--a ceremonial title--and is made the honorary Colonel of a regiment. I assume the regiment goes to France, but Grantham does not. It's likely because of his age--though perhaps, his rank as an earl may have something to do with it. The Grantham heir, Matthew, signs up for the army almost as soon as the war is announced. He is a Lieutenant in 1916, making him a junior officer. By 1918, Matthew is a Captain and while fighting in the Battle of Amiens, becomes severely injured. He is self-loathing, despondent and confused. He feels worthless after his wounds. In the meantime, downstairs, William the footman joins the army, all puffed up to fight for King and Country. He doesn't seem to question why there's a war on--in fact, the only character I've seen question that is Branson the chauffeur--but is desperate to join the fight. As a servant outside of the army world, William is probably a private and becomes batman to Matthew. A batman was a personal servant to officers, sort of like a trench valet. William is even more severely injured than Matthew, comes back to Downton--where it takes the Dowager Countess meddling and string-pulling to get William back to Downton Abbey. Because he's not an officer, the doctor in charge of the convalescent home and local hospital says, he doesn't want William back at the house, despite him being a servant there before the war and being from the local area. Thomas, the other footman, joins up early. He becomes a medic, thinking that he won't have to see much action that way. Thomas is an astute, if scheming character, and likely knows that with the war, enlisted men will bear the brunt. However, Corporal Barrow ends up treating the men in the trenches. After some scheming, he ends up serving the rest of the war back at Downton, first the hospital, then the house. He is promoted to Sergeant because it's felt that the men recuperating at the house will better listen to a higher ranking man. This topic made me think of a few other examples, non-Downton. Rhett Butler in Gone With the Wind. Rhett does not join the Confederate army. He is a blockade runner and speculator--he makes a profit off the war and is derided for it by the other characters. Yes, he takes advantage of the war and associate with Yankees, but he does it quite openly. In the end, as Sherman marches toward a burning Atlanta, Rhett joins the Confederate army for one last stand. The Waterloo Roll lists men, by regiment, department, rank and remarks on whether they died, were wounded, etc. As I had planned on having several characters in my Regency project fighting at Waterloo, I read the roll call. I found that reading ranks such as "Capt. The Hon. ____" made me feel as if I'd plunged myself into a Regency novel. "The Honorable" is a quasi-designation given to the younger sons of earls, all sons and daughters of viscounts and barons. The little people are starting to take over, or are they? Has military status created a new class of people, perhaps even to a point where it replaced noble titles. 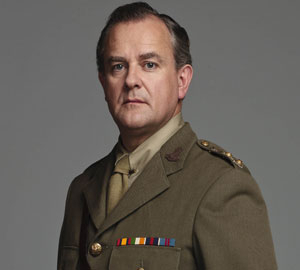 All Robert (Lord Grantham) does anymore is walk around his estate in a military uniform and complaint about how it's not enough. The first two episodes revolved around the last three men not in service: Robert, William, and Mosley. Then again, "the honorable" and other empty titles were added to military rank to signify if the men were of noble birth. So there are definitely perks to noble birth in war, including a ticket to the uber-special convalescence home. In the episode before this one, Lady Grantham (or Cousin Violet, if you prefer) had to pull quite a few perks to bring William to Downton convalescence home. It sounds like we'll see Major Bryant's father soon. His behavior was utterly disgusting. (I thought he looked creepy from the get go, but I'm willing to assume people back then might find him attractive) But how is everyone's behavior towards poor Ethel any better. She is a young, unwed mother who's son, she rightly stated, also had a father who died in the war. As opposed to the new maid at Downton, whose husband died in the war but who is outstaying her welcome by making gooogooo eyes at Robert. During the former war times, Robert was literally the only member of the house without a purpose. Even Cora rose to the cause. Downton is on the cusp of a new world. And we can see and feel the sharp difference between the Crawley household and the outside world if you will. When Matthew first knocked on the Downton door he had his beliefs and ideas but the first season was pretty much the shaping of Matthew Crawley. NOW, we have this new fellow a "newspaper man" who is ridiculously wealthily and brash. He isn't going to relent to the Crawleys, he's going to push them, or at least Mary, into his world, right down to the furniture, which will be purchased! Perhaps it's me just being very cliche but this dude reminds me William Randolph Hearst (a la Citizen Kane). The noble class starts dying, Mary is after all buying someone else's house. A house they are selling because they can't afford it anymore. I think Sir Richard Carlyle (no idea how he became a sir) brings in the origins of yellow journalism that we start seeing. Remember what he tells Mrs. Bates (whom I love. But that could just be my love of Maria Kennedy Doyle): he's a newspaper man, it's his job to know things and buy it up fast. To be honest, I don't know a lot about the effects of WWI on the aristocracy, but I know that Julian Fellowes has said that that way of life--the large country estate, the Season--went on through the 20s and then died in about the 30s. So yes, Downton is on the cusp of a new world order, at the very least. In the decades to come, their younger servants will find better ways to educate themselves and find better employment. With the deaths of so many sons of noble houses--like the son of the house Mary and Carlisle were looking at--the nobility no longer have their heirs to take the title and the estates. Those houses will either be sold to the nouveau riche or sold as schools, hospitals and orphanages because the owners could not afford the after-war taxes on their property. I would say, though, that the military status affording certain opportunities only goes on for a relatively short amount of time. And to me, at least, it seems that the person's military status is tied in to who they were before the war. By 1914, the practice of buying an officer's commission in the British army was long gone, but I think of it as fairly similar. Matthew Crawley is the heir to an earldom and an upper middle class lawyer, thus he enters the army as an officer whereas William enters the army as a lowly private and not only that, but an army servant as well. So I'm willing to bet that Bryant is at least upper middle class and was likely a creep before the war, too. Thank you so much for the thought-provoking comment!